What makes a good data analyst? This is a question I get regularly asked as I help people explore ways to see and understand their ever-growing volume of data. Analytical skills, communication skills, math, and attention to detail are usually thrown around as the essential skills required to be a good data analyst. For me, the answer is much simpler. There is no doubt that the above skills are important. But in my opinion, the key ingredient is curiosity. I would go as far as to say that curiosity, inquiry, and critical thinking will be the key requirements for any future employment. “In the world where vast inequalities in access to information are finally being levelled, a new divide emerges—between curious and incurious,” writes Ian Leslie in his brilliant book Curious: The Desire to Know and Why Your Future Depends On It. You can teach math, analytics, and even how to drive a car, but it’s much harder if not impossible to teach someone the urge to experiment and explore the world around them. As a result, you can easily find courses for math and programming, but hardly any training for curiosity. In fact, curiosity is hard-wired into our brains. We are born with it, and from a very young age, we crave to satisfy our curiosity. As young children, we ask around 300 questions a day, according to a British study. But as we grow older, we are taught to suppress our inquisitive nature. You can always reverse this downward trend by being inquisitive and by asking curious questions. So next time you are looking for talent, hire for mindset, not skill alone. So what does this look like in the world of data and analytics? It’s quite simple, really. Equip yourself with tools that will allow you to ask and answer your questions. Instead of focusing only on the final destination, enjoy the journey as you never know what you might find along the road less traveled. Allow me illustrate by taking you on a short trip of my own. As a self-confessed data and visualisation geek, I am always looking for new, interesting, and preferably real-world data sets. A few months ago I stumbled across just such data. It’s real because it was generated by a real human called Will, and it’s interesting because it was collected by a cell phone service provider forced to do so by law. Yes, it is a legal obligation for telecommunication companies in Australia to collect their customer’s cell phone and Internet usage data. 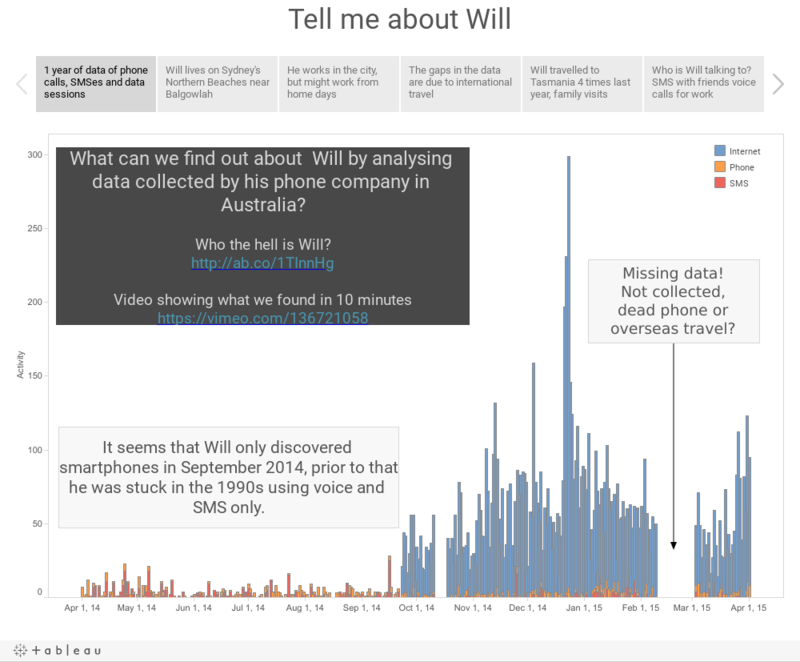 If you, like me, are curious and have 10 minutes to spare, let’s get intimate with our data and see what we can find out about Will. I am a professional data analyst and I am constantly looking for time to explore data available at work. However, a prior departmental Director saw these explorations as a "waste of time" even when I brought to light important insights related to areas where we could improve operations -- only because it wasn't a area of "focus" at the moment or, more typically, because I wasn't directed to investigate that area (even though my job description included looking for, and notifying, management of areas for improvement!) Did I ever stop exploring the data? No, I just made sure that the "assigned duties" always got done and done in a timely manner, and used what free time I had to explore the data -- and only brought up what ever I discovered when the topic came up later by management, which happened quite often. The reality is that most professionals aren't necessarily given the time on-the-job to explore the data available to them them. They are directed to specific analytical tasks, or building specific applications or reports, or other such activities. Our natural curiosity in the data before us remains, but is often suppressed on-the-job.